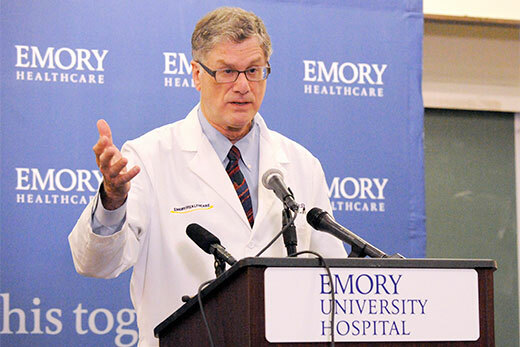 Dr. Bruce Ribner, medical director of Emory University Hospital’s Serious Communicable Disease Unit, speaks at a press conference Aug. 1 announcing that Emory will be the first hospital in the United States to treat Ebola patients. Photo by Jack Kearse. Doctors, nurses, scientists and caregivers who are fighting the biggest outbreak in history of Ebola virus disease, including Dr. Bruce Ribner, medical director of Emory University Hospital's Serious Communicable Disease Unit, have been named as TIME magazine's 2014 Person of the Year. The announcement was made on the NBC TODAY show. Three people who cared for patients with Ebola virus disease and then were treated at Emory after contracting the virus are also included in the TIME coverage. They are Dr. Kent Brantly, physician with Samaritan's Purse who was transferred from Liberia to Emory University Hospital in August, becoming the first Ebola patient treated in the United States; Nancy Writebol, a missionary with SIM organization who was also transferred to Emory in August, becoming the second Ebola patient in the U.S.; and Amber Vinson, nurse at Texas Health Presbyterian Hospital, who became the fourth patient with Ebola treated at Emory University Hospital. "The rest of the world can sleep at night because a group of men and women are willing to stand and fight," wrote TIME editor Nancy Gibbs in making the announcement. "For tireless acts of courage and mercy, for buying the world time to boost its defenses, for risking, for persisting, for sacrificing and saving, the Ebola fighters are TIME's 2014 Person of the Year." Ribner and Brantly are among five Ebola doctors profiled with first-person essays about their experiences. “When we knew we were getting our first patient with Ebola back in July, we said, ‘This is what we’ve been training for 12 years. We’ve drilled this at least twice a year for over a decade. This is what we’re here for.’ We knew we had an opportunity to do something that basically had not been done before,” Ribner recalls in the essay. Brantly, who is featured on one of TIME’s covers, writes in his essay about arriving at Emory University Hospital and learning from his wife, Amber, about the intense public attention focused on his treatment here.